Out of print, a limited number are still available from Betsy. Also available as an E-book. In this compelling and beautiful work of creative non-fiction, writer and poet Betsy Warland takes the reader with her as she negotiates her mother’s growing incapacity and death. Her narrative traces the story that bound them together in the mother-daughter relationship, and her reflections help her find clarity, understanding and acceptance. 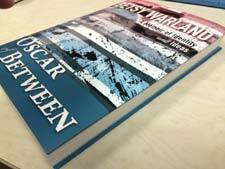 Warland weaves a common ground that moves beyond duty and despair, providing both questions and guideposts for readers, particularly those faced with ageing and ill parents and their loss. Get the inside story with Bloodroot extras below. 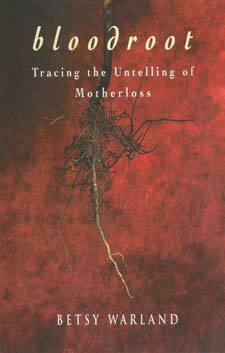 Since its publication in 2000, Bloodroot – Tracing the Untelling of Motherloss continues to be my most beloved book. Although it’s been out of print for a couple of years, readers and writers frequently tell me how much it means to them. Recently, a woman who had read Bloodroot in her book club mentioned it to her husband, who read it. Then they bought copies for their family attending his mother’s memorial service. Watch video of the Bloodroot book trailer. 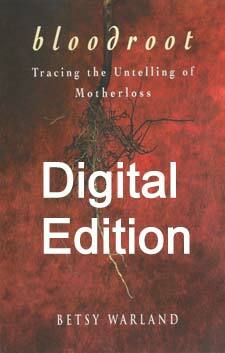 Get the inside story about how I wrote my book, Bloodroot: Tracing the Untelling of Motherloss. I had never before encountered such a strong imperative to slow down my writing process. It was disorienting and I doubted it. I tried to fudge it a bit (slow down a bit more) but it didn’t co-operate. The writing faltered. What first planted the seed for writing Bloodroot?